Today, on Sep. 13th 2010, Mario celebrates his 25th birhtday. Woohoo. I think this is the longest appearing of a human gaming character ever. Of course Pac-Man appeared one year before Mario, but come on, it's not human, is it? 1981 the birth of a star in the gaming universe happened in "Donkey Kong". In 1983 he had his own game together with his brother Luigi with Mario Bros. Then it was a like a shooting star career. 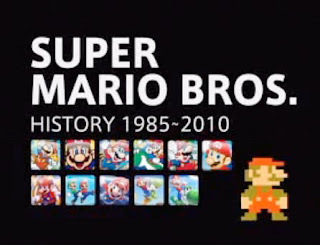 Super Mario Bros. , Super Mario Land, and Super Mario World make him the most recognized game-char in history and created a whole gaming universe in it's own. The latest "New Super Mario Bros. Wii" going a little back to the roots, which makes it one of the coolest Mario-Games. Update: Joystiq.com has some more info about the 25 anniversary pack.